Raise your hand if you like standardize testing! Ok, just kidding. One of the things I can't hardly stand giving are traditional summative test to my students. I try to give as little tests as possible. Students get bored getting test after test and I can't stand grading stack after stack of them. So then I just heard about Authentic Assessments and it sounds like a possible solution to my problem. Check out the video to introduce yourself to this type of assessment. Authentic assessments remind me a lot of "performance tasks". This was a big point of emphasis last year when I taught at NAFCS. Both involve personal, real world experiences. The difference I feel is that performance tasks rely on students taking what they have already learned and mastered and apply in a new way; while authentic assessments can still be used as an assessment to measure mastery of a topic. One way I try to incorporate authentic assessment in to my classroom is by bringing real life situations into the classroom. One piece of technology that helps me to do this is my smartphone. I don't have the facts, but I'm pretty sure the majority of you that will read this has one. If so, they are a wonderful tool that can help in education and not just for social media. No matter if it is math, science, social studies, or reading, I try to be observant of the things around me when I'm out and about that my students can connect to with our topic of study. Whenever I see something useful, I capture it with my phone, either by pictures or video, and through technology share it with the students. I then normally pose some questions to see if they can relate what they have learned with a real world example. For example when studying weathering, erosion, and deposition, I was traveling when I saw a great example of this. I showed the photo and shared some minor details of it to the class for clarification and simply asked to write an explanation of what was happening. In their explanation they were to use the terms of weathering, erosion and deposition. After doing this and further study of the topic, we came back to the photo a couple days later,and had a quick discussion so everyone had a clear understanding of the photo. Next, students were to search and discover an example of weathering, erosion, and deposition of their own, take a photo or draw a picture of it and describe how it is an example of weathering, erosion, and deposition. What made this assessment authentic was the fact students had to go out in the real world and apply their knowledge. Students had fun sharing and it was great to see all the different examples they discovered and how applied their knowledge. I encourage all teachers out there to see how they can start adding in more authentic assessments into your classes. My first reaction to this was "Duh!" But after some thinking, I am going to agree and disagree with this statement. I disagree because last year when teaching in New Albany, I received a brand new SmartBoard in my classroom. As soon as the students walked into the room they were excited! All students wanted to be in the room and couldn't wait to interact with it. So just having this popular tool the students were excited because it was NEW. I agree with this statement because it is not the popular tools, but the new way of learning that students are able to experience with these tools brings out true excitement in students. Once getting the SmartBoard, the way student where interacting with each other and the content of study began to change the way they learned into a more interactive and interesting way, therefore the students were excited to learn. Ultimately teachers need to remember is that students get excited when learning is real and personal to them and technology is just only a tool that can help achieve this, but isn't always required. New Tool = New Rules? There is no doubt in my mind, with the continued implementation of technology, it is changing the traditional classroom and school career for our students that is currently in place. Just check out this Edutopia video about An Introduction to Technology Integration. I don't know about you, but a classroom like this seems like it will lead to a very different education for future generations of students. I'm wondering if/when these changes start to happen, are we (those of us in the field of education), parents, students, community members willing to change the traditional setup of a classroom and how students progress through the system? Can we abandon the traditional A-F grading system for more of a standards based report card? What about having students stay with the same teacher for more that one year? Letting that student/teacher relationship develop further and progressing those students able to work ahead to the next grade level or having more time to master concepts without the rush the "end" of the school year and moving to the next grade level and new teacher. I see students that are ready to move on and excel in their learning really benefiting from this style of classroom. Could we end up seeing those students graduating high school at age 15 or 16 or the very least graduating with dual college credits? What about those students who struggle with some concepts. If they need more time and learn at their own pace, will it be accepted if they don't graduate until age 19 or 20? However technology changes the future of our schools and classrooms, as long as it is for the betterment of the students, we (teachers, administrators, unions, parents, and policy makers) should be supportive of these new rules that will come along with our new tools. 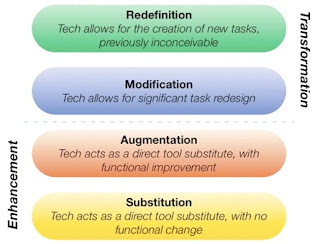 Dr. Ruben Puentedura has created the SAMR model, which is a four-level approach to selecting, using, and evaluating technology in education. His presentation is available on iTunes and is well worth viewing. The acronym is expanded below. Some teachers are willing to use technology in their classrooms as long as they don't need to change their teaching strategies. So, iPads may become digital worksheet machines while laptops function as PowerPoint creators or word processors. But with technology in our classrooms, there are so many more options that can be done with today's ever changing technology. 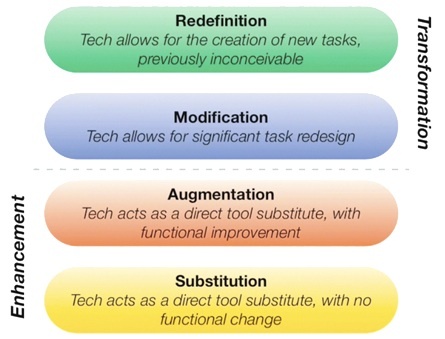 So the question arises, Is it wise to allow teachers to take "baby steps" initially by only implementing technology at the lower levels of SAMR, or should peers and administrators insist that educators examine and adapt their teaching methods to include more engaging uses for technology, too? Like all humans, teachers are creatures of habit and for teachers established in this profession for 5 or 10+ years, I would assume it would be very difficult for most teachers to "flip the switch" and immediately begin using technology and teaching at the redefinition level. Especially those teachers that have filing cabinets full of lessons and worksheets that have been used year and year with fidelity. If this is the case, I would believe the best way is to use baby steps for some teachers. Nevertheless, the goal of baby steps is to allow teachers to examine lessons and methods so in the future all teachers are able to include engaging uses of technology. However, I believe with the baby steps approach, we can't be content or put limitations on ourselves or our students (I have a feeling students are going to be jumping right it.) Once we get Chromebooks next Fall, I know some teachers are going to be able to jump right in, while some will be taking baby steps. Why do you assign homework? In the article, “Are You Down With or Done With Homework?” it quotes a publication that is on the U.S. Department of Education website titled Homework Tips for Parents. This publication states, "Homework can help students develop study skills that will be of value even after they leave school.” It then gives examples like: learning happens anywhere, independence, responsibility, and time management. I disagree with this statement because this should not be the goal and reason for assigning students homework. During my junior high and high school years of education, when I was assigned homework, I did not immediately think “Oh great, I get to practice how to be responsible and manage time!” I thought what’s the point of this stupid worksheet. In my classroom I try to make sure homework is purposeful and meaningful to the students. I try to make it an extension of the learning that takes place in the classroom. This article states what homework should be in the perfect world, “Ideally homework should be about taking something home, spending a few curious and interesting moments in which children might engage with parents, and then getting that project back to school — an organizational triumph.” This is what I try to achieve if I assign any homework, but I know this doesn't happen with every student because the organization it is referring to, the parent, student, teacher organization is fractured because of the different viewpoints on homework. From their own experiences parents see homework as a task that just needs to be completed and not part of the learning process. Teachers give worksheet of rote practice because they feel students need it. While students get home, have to deal whatever circumstances are there and the last thing on their mind is homework. Now in hindsight, I believe some students will look back and see how homework might have helped develop important skills that are useful after they leave school (probably more from high school experiences than in the elementary setting). But I don’t believe in the argument of homework or no homework that "Homework can help students develop study skills that will be of value even after they leave school” is a very good or valid point for assigning homework.